Even Honda have been taken aback by the success of the MSX125 since its launch in 2014 and now the firm is out to capitalise on its popularity by mixing the MSX’s usability with the classic style of its legendary Z50 Monkey. The MSX – known as the Grom in the American market – was launched as something of a curiosity but struck a chord with buyers. Cheap, fun, light and stylish, it’s a 3/4-size bike; small enough to be thrown about but big enough to be usable for commutes and city riding. In the UK Honda sold around 1000 of them in 2015, outperforming any of the firm’s larger-capacity models. Elsewhere the bike has proved equally popular. The recipe isn’t a new one; put a scooter-derived engine in a scaled-down motorcycle. And it’s hard to find a road test of the MSX125 that hasn’t made reference to its great-grandfather, the Honda Z50 Monkey, which first popularised that idea back in the 1960s. While the Monkey is still in production, it hasn’t been sold in Europe for years as it has little hope of meeting emissions regulations and is too small for real-world use. 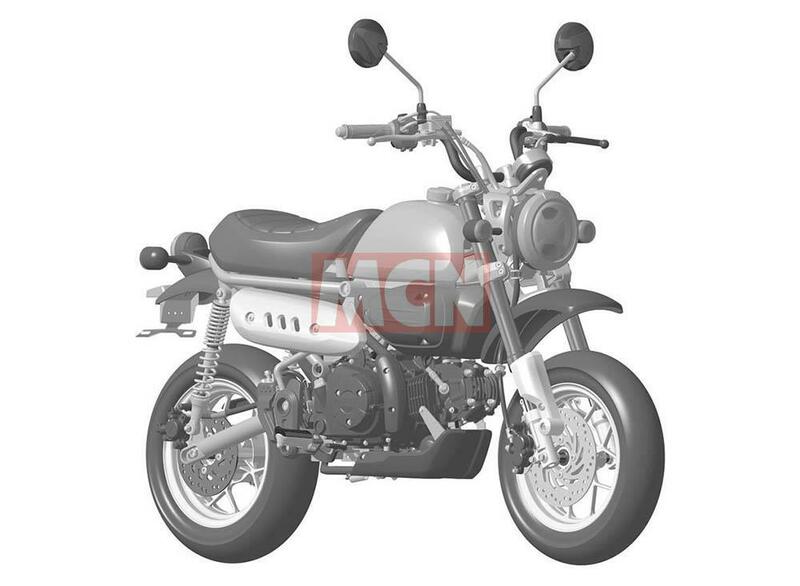 Now Honda looks set to mix the MSX’s mechanical parts with the styling of the original Monkey, creating a modern take on the classic machine that will be legal to sell in emissions-restricted markets like Europe and America. 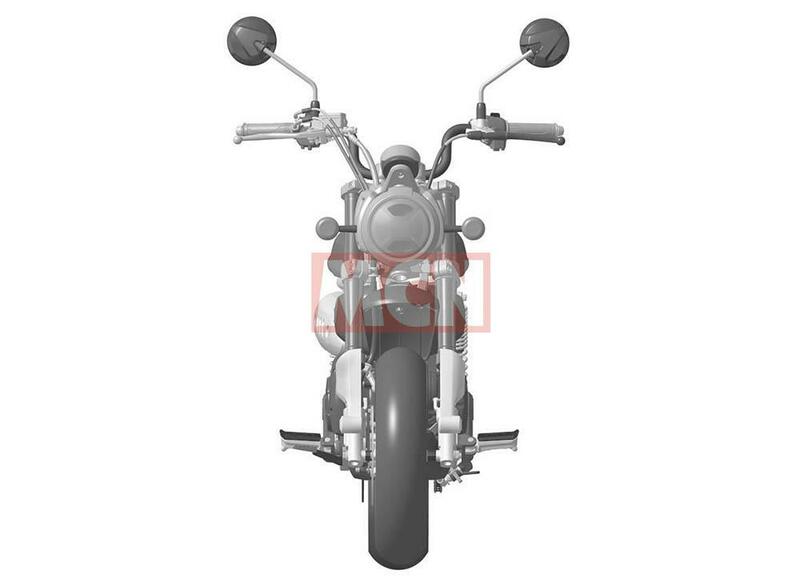 The above pictures come from Honda’s own patents for the bike’s styling, clearly showing the model’s final appearance. The frame and engine are from the MSX125, which also donates its wheels, brakes and front suspension. At the back there’s a new single-seat subframe which also serves to create mounting points for the twin shocks that replace the MSX’s monoshock design. Below them lies a tube-section swingarm, mimicking the original Monkey and replacing the box-section arm of the MSX125. 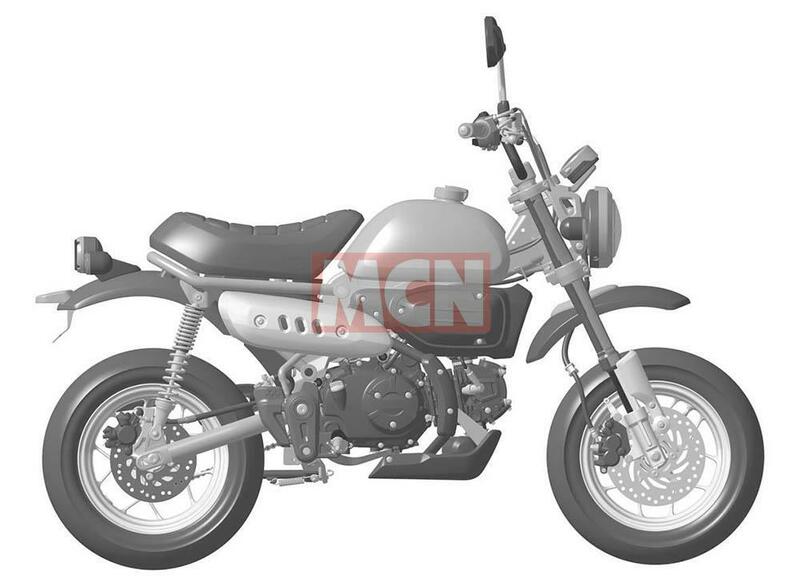 While these patents are the first clear hint at a production future for the machine, Honda has already dropped suggestions that it could make such a bike. 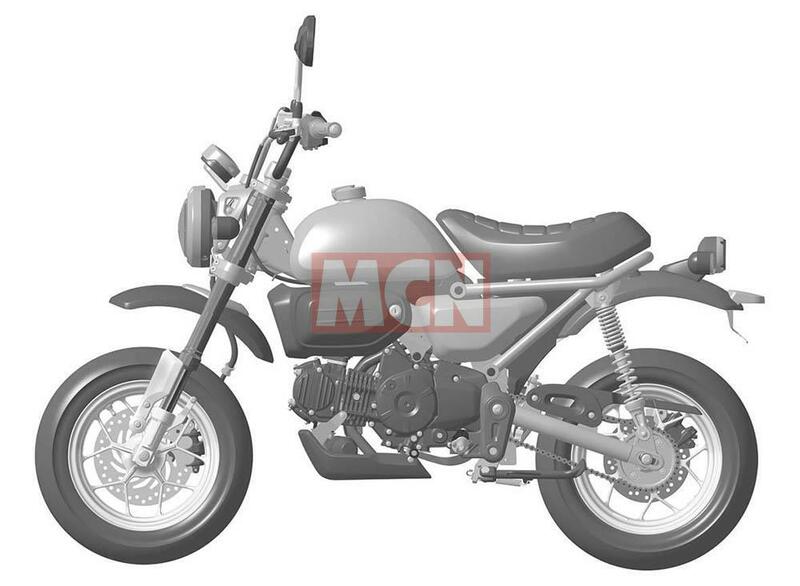 A very similar-looking, MSX-based concept was shown in Bangkok earlier this year. It was largely ignored as there was no official Honda publicity surrounding it and the bike was seen as a creation of Honda’s local Thai arm. Now it appears that the concept might have been previewing a production model because these patents have been filed by Honda’s head office in Japan. The patents also feature subtle differences when compared to the concept, adding to the likelihood that they actually show a production machine. 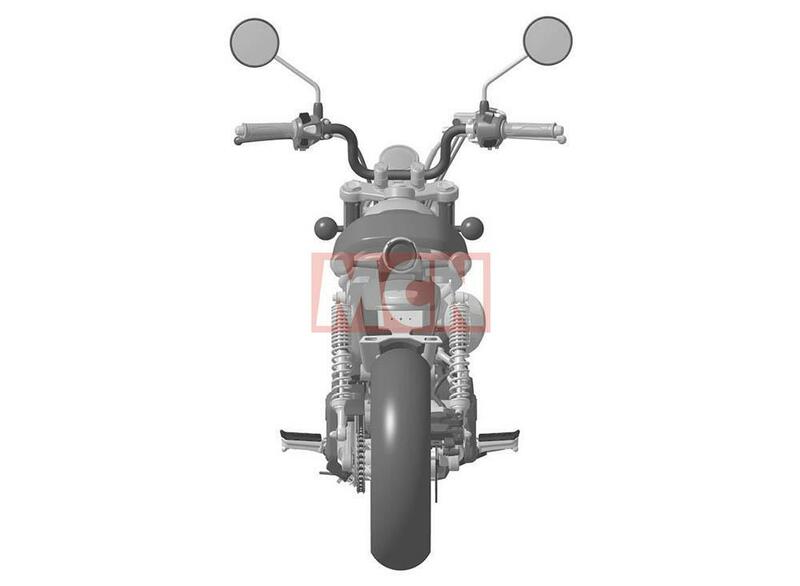 Despite the clear Monkey bike looks, it’s a much larger machine than the original. The current Z50, still sold in Japan, is just 1365mm long with an 895mm wheelbase, with 8-inch wheels. The MSX has 12-inch rims which are shared by the bike in these pictures. 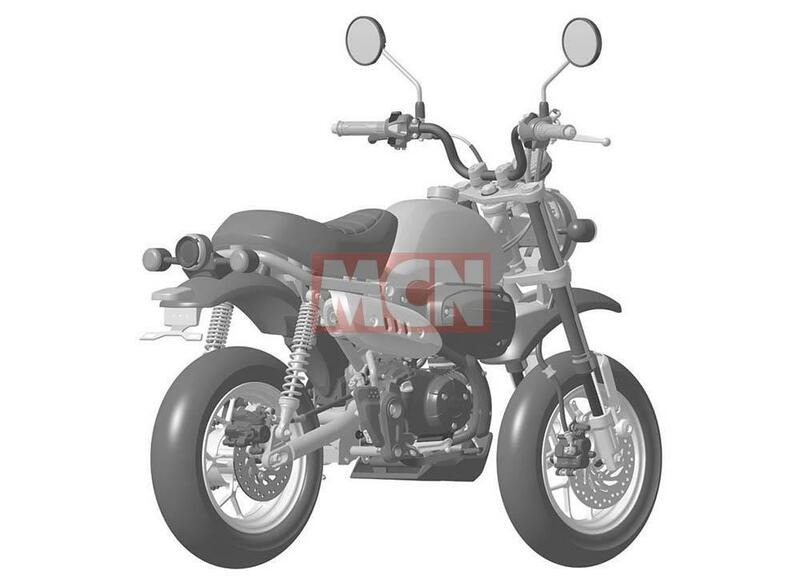 That this new model retains the classic Monkey proportions despite using the much larger MSX wheels hints that it’s significantly bigger overall, probably close to the 1010mm wheelbase and 1760mm overall length of the MSX. It also lacks the original Monkey’s folding handlebars, so forget notions of easily packing it away into the boot of your car. However, those larger dimensions also mean it should be just as real-world usable as the MSX125 and infinitely better to ride than a ‘real’ Monkey. 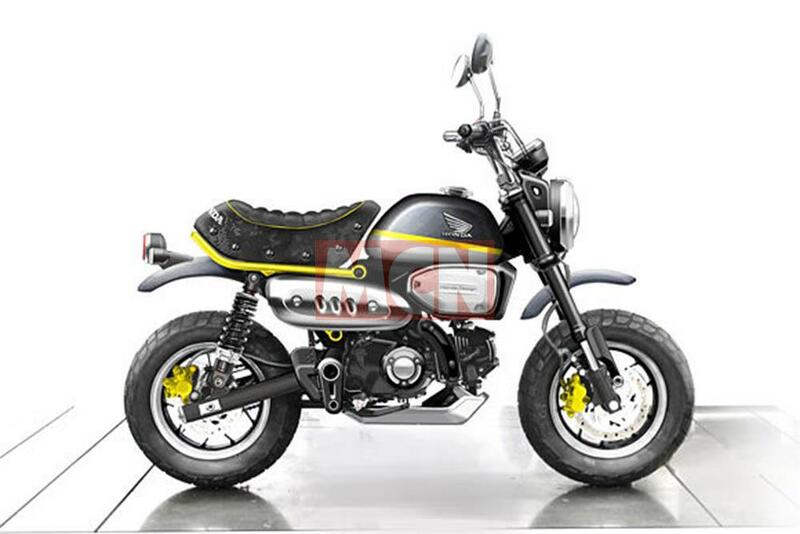 In pursuit of convincing looks, the bike gains a different exhaust to the MSX, taking the classic Monkey’s scrambler-style high-level pipe instead. 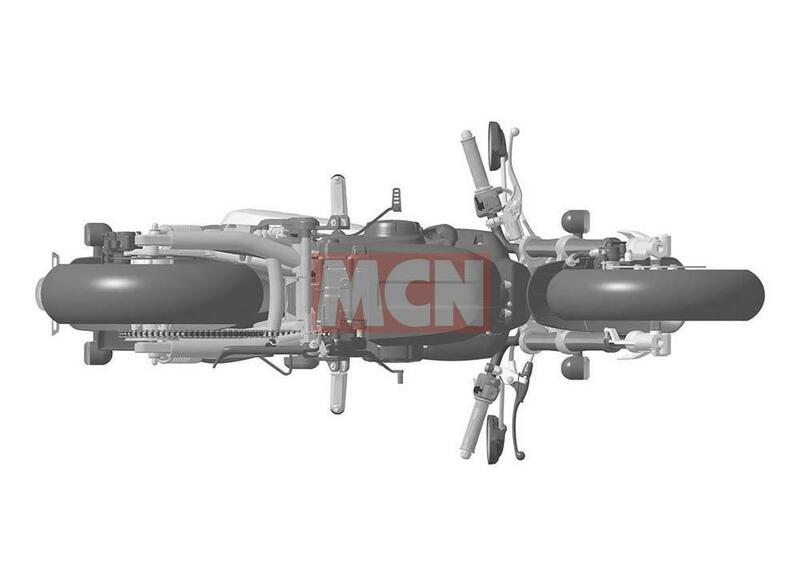 However, Honda has tucked a catalytic converter into the bash-plate, so gasses from the cylinder exit straight down into the cat to be filtered before they’re routed back upwards again into the retro-style pipework. Above the engine there’s a large air filter case on the right hand side, hiding the fuel injection system, and matching panel on the left that’s actually a storage locker. Although it’s possible that this design is intended for a mere concept bike, it’s unlikely. Details like the licence plate hanger are production hints. The number plate light cleverly extends the rear just enough to meet European legal demands that bodywork must extend beyond the rear edge of the back tyre. 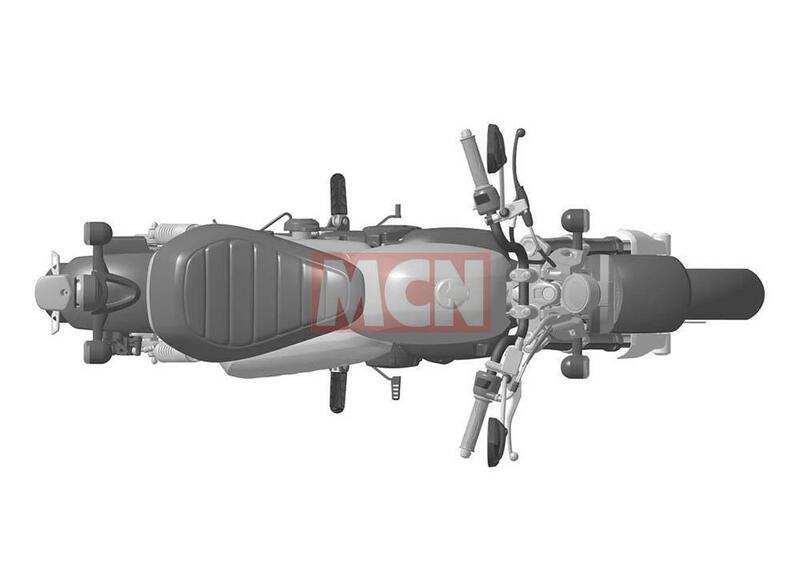 Details like this, and of course the carefully-positioned catalytic converter, tend to be missed out on concept bikes. In terms of performance the bike will be pure MSX125 – 9.65bhp at 7000rpm from a 125cc single and a weight of around 100kg. With luck the price will also be in the MSX’s sub-£3000 area.